Kayla’s story is just one of the many success stories that come from community collaboration and outreach. It is also testament to the notion that when we give, we actually get more in return. An amazing inspiration to her fellow staff and campers, Kayla is now in her fourth year as a counsellor. As a camper, she developed strong friendships that she believes helped her achieve personal success and navigate tough times. In addition to making new friends, camp also helped her reconnect with old friends broadening her support network. Kayla says one of the reasons she likes being a counsellor is the ability for her to give back to campers the skills, support and confidence that she received once herself. Her understanding and appreciation of Jewish and Israeli culture is also something she credits Centre Camp with, and something that she makes sure to pay forward. “You come to camp to have fun, but I’ve learned a lot from camp about the Jewish culture,” says Kayla. “This helps me figure out who I am and as I grow up this still shapes me.” Her first time hearing the Israeli anthem, Hatikvah, was in camp as well as many Shabbat songs and activities. 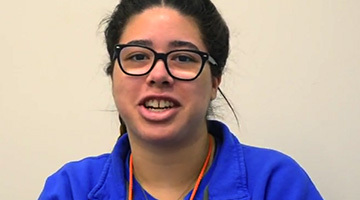 Each time she is inspired, she brings that information and joy home to share with her family, especially her younger sister who is now also a Centre Camp camper. What is Kayla Daniels’ JCC Story? It’s the message of connection, friendship, support and giving back.